This guide will walk you through setting up a Laravel development environment on Elastic Beanstalk. Before using Elastic Beanstalk, I was using a shared hosting account, and I got fed up with outdated packages and the lack of admin privileges. My goal with this guide was to create a dev server that closely mirrored my intended production environment in Elastic Beanstalk (another post on that coming soon). This is the exact setup I use for SimpliFit’s API dev server. First, a quick overview. Amazon Web Services’ Elastic Beanstalk is a Platform as a Service (PaaS), allowing developers to deploy applications without the hassle of detailed server infrastructure, such as server provisioning or scaling to meet demand. Elastic Beanstalk can also manage an AWS Relational Database Service (RDS) instance, however, for a Laravel application, this is not a preferred solution. When an RDS instance is created by and associated with an Elastic Beanstalk environment, it will also be terminated (and thus all data lost) when that environment is terminated. This will be further discussed in a later section. Your computer should already have git installed, and you should have a git repository initialized with your Laravel installation. You should have an AWS account created. For our Laravel application, we will be using a MySQL database, so we must first create a MySQL RDS instance in the RDS Management Console. Select, as required by your application, whether you want to use Multi-AZ Deployment for this database. Since we’ll be using this Elastic Beanstalk application for development only (and we’d like to stay within the free tier usage), we’ll select No here. A post in a few weeks will cover this process for a production environment. To determine the right settings for your Laravel application, it’s best to test various environments to see which fits your needs. 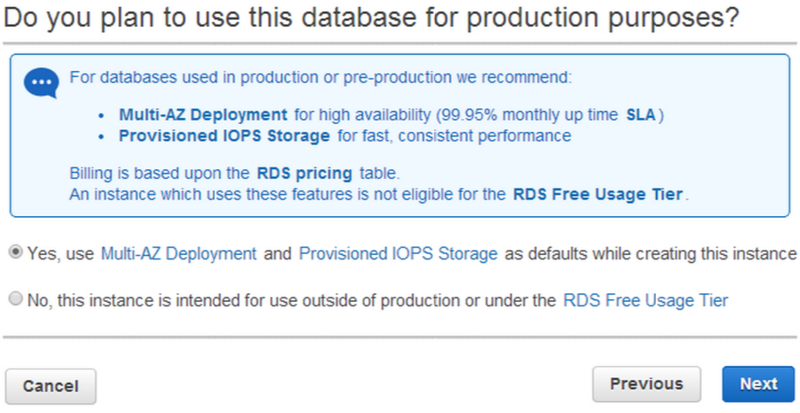 As long as you only have only one RDS instance running at a time, you’ll fall within the free usage tier. Unless you have created a separate VPC for your application, select the default VPC and default DB Subnet Group. 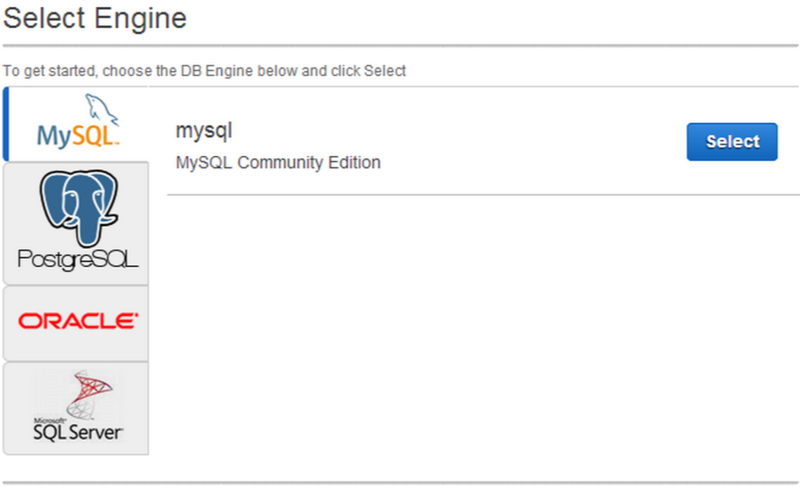 Set this DB to be publicly accessible and select an Availability Zone. This is the AZ that you will want to also launch your Elastic Beanstalk EC2 instances in. Finally, give your database a name and click Launch DB Instance. Launching the instance may take some time, but luckily we can complete the next steps during this time. Note: If you already have an Access Key ID and Secret Access Key for your account, skip this section. In the Identity and Access Management (IAM) console, you will need to create new security credentials for your account. Note: You need to have access rights to the IAM console. If you are not the owner/admin of the AWS account, you will need to request that security credentials are created for your account. Navigate to the “Users” section in the left-hand menu. Select your username and then select the “Security Credentials” accordion. Click on “Manage Access Keys”. In the lower right-hand corner, click “Create Access Key”. Click “Show User Security Credentials” to view the credentials you just created. Keep this tab open, as this data will be needed in a later step. Alternatively, you can download your credentials as a .csv file to store until needed. To give us the ability to SSH into the EC2 instances that are created as part of an Elastic Beanstalk environment, if the need arrises, we first need to create a key pair in the EC2 Management Console. Select “Key Pairs” under “Network & Security” in the left-hand menu, and click “Create Key Pair”. Give your Key Pair a name to describe it and click “Create”. Your Key Pair is downloaded as a .pem file. You’ll need this file if you need to SSH into your EC2 instances, so don’t lose it! The simplest method to interact with Elastic Beanstalk may be the GUI interface in the AWS Management Console, however the eb command line interface (CLI) offers many of the same features to deploy applications quickly and easily from your computer, especially when using a git workflow. Open command prompt/terminal and navigate to the root directory of your Laravel installation (and git repo). You will now be prompted to enter your AWS Access Key ID and AWS Secret Key, which were generated in a previous step. If you’ve already run eb init on this computer, your previous keys will already be pre-populated; just hit enter to select them. Next you will choose the service region for you Elastic Beanstalk application. Choose the same region in which you created your RDS instance above. In this case, our RDS instance was created in “1) US East (Virginia)”. Now give your application a name. The default value is the directory name. Then give your environment a name (e.g., development). For your environment tier, select “1) WebServer::Standard::1.0”, as we are setting up a webserver. Next, we get to select our solution stack. As of this writing, the latest version of the Amazon Linux AMI with PHP is v1.0.4 and runs PHP 5.5. We will be choosing that stack (#1). Since this will be a development application, we will be choosing a “SingleInstance” environment. This also ensure we’ll stay within the free usage tier for EC2, as long as we only have one running environment at a time. 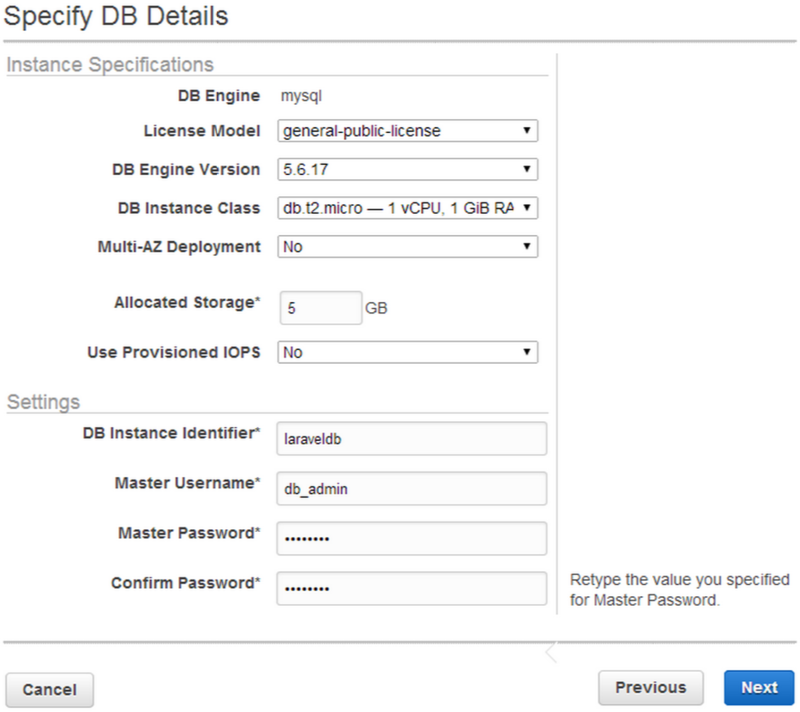 We created an RDS DB Instance separately, so we’ll answer “n” for no to the next question. Next we need to attach an instance profile. This gives the EC2 instances that are created security permissions to access other AWS services (such as S3 for storing logs and and application versions). If you’ve created a profile already, choose that, otherwise select “1) [Create a default instance profile]”. After a few seconds of waiting, you’re done! Congratulations, you created a new Elastic Beanstalk application, associated it with a git repo, and set some initial options for each environment that’s created. This includes which region to launch EC2 instances in, how many instances should be created, and what should be installed on those instances. If you head over to the Elastic Beanstalk management console, you’ll see your application listed under “All Applications” (with no environments created, yet). 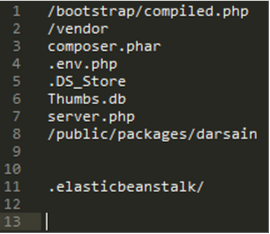 And if you navigate to your project directory in your code editor, you’ll see a new directory, “.elasticbeanstalk”. At the moment, this contains a config file with all the application preferences we just set. Look at that! The new eb directory has already been added to our .gitignore file. Awesome! The line breaks just need a bit of cleaning up and it’s good to go. Normally, once eb start (this command starts an environment within your EB application and is covered in a later section) is run, a new file is created in the .elasticbeanstalk directory: optionsettings.app-environment-name. Since we want to set some of these options BEFORE an environment is started, we’ll create the file ourselves. This file contains all the options for Elastic Beanstalk, including options for creating new EC2 instances (and RDS instances). Refer to AWS Elastic Beanstalk Developer Guide – Option Values page for descriptions of each part of the code below. The code below is for an application that does not include an RDS instance (i.e., the RDS instance is created manually). First we start off with auto-scaling options. Since we’re running a single instance environment, MaxSize and MinSize are both 1. This means that EB will ensure you always have 1 EC2 instance running at all times (e.g. creating a new instance if the existing one goes down). We’re also specifying the Availability Zone we want our EC2 instances to be created in. EC2 instances in the same AZ as your RDS instance will cost less and connections between them will be faster. 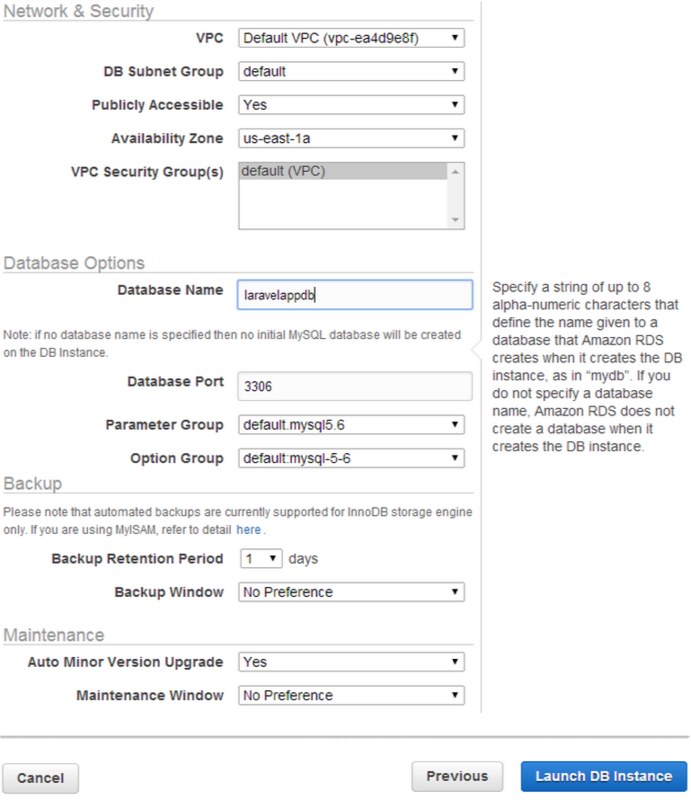 Set this option to the AZ in which you created your RDS instance. The next option we’re editing is the EC2KeyName, which is the name of the key pair we created several sections ago. This will allow you to SSH into your EC2 instance(s) if the need arises (though you likely won’t need to). The aws:elasticbeanstalk:application:environment contains your environment variables, which are added by your config files. You don’t need to edit this section, and even if you did, this doesn’t seem to actually set the environment variables (it just displays them). Finally, we’re going to modify a few options under aws:elasticbeanstalk:container:php:phpini. We will set composer_options to –no-dev, so that dev add-ons aren’t installed when composer install is run. Last, we’ll set document_root to /public so that it points to Laravel’s public folder. Located in the .ebextensions directory in the root of the project, the config files (*.config) contain commands for the environment to run and options to set. These config files run every time git aws.push is run (i.e., the environment is updated or a new EC2 instance within the environment is started), and they are run in alphabetical order. These config files SHOULD NOT be in your .gitignore file. To start, we will create three files: 00environmentVariables.config, 01composer.config, and 02artisan.config. Here, namespace refers to the specific groups of options in .elasticbeanstalk/optionsettings.app-environment-name. Using the namespace elasticbeanstalk:application:environment we are stating that the options and their values below are for that namespace. DB_HOST will be the endpoint shown in the RDS dashboard for the RDS instance set up earlier. DB_PORT is usually 3306, unless changed during the RDS instance setup. DB_NAME is the name of the database within the RDS instance (not the RDS instance name). DB_USER is the username that was created during the RDS setup process. DB_PASS is the username’s password. Here is where you will add other environment variables, such as a MailChimp API key, an SQS host, etc. Note: These environment variables can also be set manually in the EB Software Confirguration panel. If you do not want to have your DB credentials in your git repo, then you would manually set these variables. First, commands are executed, which are run before the application and web server are set up. Here we self-update composer.phar to ensure the latest version is running on the instance. Next we set a COMPOSER_HOME environment variable. Last, container commands are executed, which are for the environment’s app container. These are run after the application and web server have been set up, and these commands have access to environment variables. Here we run composer optimize. Note: EB will automatically run composer.phar install if it sees a composer.json file in the root directory AND does not find a vendor folder in the root directory. If your vendor folder is not in .gitignore, you will need to add composer.phar install to this file yourself. In the 02artisan.config file, we specify container commands to run migrations and seeding. These commands should ideally be run only once, or if you are adding/modifying tables. I also tend to just migrate:refresh the database every now and then on the development server, as error tend to compound themselves and exceptions start cropping up in my app. command: "php artisan db:seed --force"
Here we migrate to create the new database (including migrating the Auth Token package) and seed the database. You’ll notice that the migrate and db:seed command were separated. Why not just run migrate –seed? In Laravel 4.2, this seems to cause an error when run on Elastic Beanstalk. Separating the two commands allows the environment to set up properly without errors when using the –force flag. Note: The –force option needs to be used here otherwise the CLI will ask for confirmation to run each command and your commands will timeout. Now that we have the config files set to create the database environment variables, we need to tell Laravel to use those for production. Note: If you are using a .env. *.php file to specify local database connection parameters, remember to add that file to your .gitignore. With all of these changes now complete, commit these changes to your git repo. The last thing left to do before starting up your environment is to give the Elastic Beanstalk application access to the MySQL RDS instance. Head to the AWS EC2 management console and click on “Security Groups” under “Network & Security”. Here you should see two security groups: the default security group and a security group created for you Elastic Beanstalk application. Click on the Elastic Beanstalk security group (for us, it’s called development, just like our environment) and copy the Group ID. Right click on the default security group and select “Edit Inbound Rules”. Here we need to add a MySQL type rule with a Custom IP equal to the Elastic Beanstalk security group’s Group ID. While you’re here, add a MySQL type rule for your IP [Tip: in the Source drop-down, you can simply select My IP]. Run eb start in the command line/terminal. Choose “no” if you are asked whether you want to use the latest commit for the environment. AWS will now set up all the resources necessary for you environment. This may take some some time. Once complete, it will give you a URL at which you can access your server. You can also view the status of your environment setup in the Elastic Beanstalk management console. Here you’ll see that’s it’s running Amazon’s Sample Application, but if you try to visit the URL you won’t receive a response. This is because the server is pointed to the /public folder where it would find Laravel, but you haven’t pushed your Laravel app onto the environment yet. Run eb status to see the status of your environment (you can also see your environment’s status in the management console). If it’s green, move on to the next section. At this point, your environment is ready to update with your Laravel application. Run git aws.push. After a few moments, it will upload your git repo to the environment and begin updating the environment. If you run eb status at this point (or visit the management console), you’ll see the environment is still updating. I find it’s best to view the environment status via the management console, as you can see a running list of events below the status. If an error occurs during the update, the event will list the command that caused the error (usually it’s an artisan command for me). Go to the Logs option in the left-hand menu and click the Snapshot Logs button. Once a log snapshot is available, click the “View log file” link to view the latest logs. Here you can investigate why an error occured. Just search for the command name that cause the error to occur. And that’s it! Navigate to the URL for your environment (e.g., environmentname-hdb582lbjd.elasticbeanstalk.com) to see your Laravel application live. Since we’ve added this environment’s Security Group ID to the inbound rules of the default Security Group, we need to first remove that rule in the EC2 Management Console. Alternatively, you can terminate the environment from the management console from within your environment. This may take some time as all the AWS resources created for your environment need to be deleted. You can monitor progress from the command line/terminal or from the Elastic Beanstalk Management Console. To delete your application, ensure all environments have been successfully terminated. If there are un-terminated environments, check the event log for errors in that environment during the termination process. A few seconds later you application will be deleted. This can also be done from the management console. Hi there, love your post with larval and elastic beanstalk. Have you have some experience with a web + worker tier + s3 storage with laravel 5? Im thinking of moving from a single cps to this kind of setup, but can’t find resources for it anywhere. Any plans for the blog on the production environment? Thank you Paul for the Guide, any production guide yet? And do you recommend forge.laravel.com for production instead, do you believe forge.laravel.com support scalable setup? I tried to contact them, no clear response. I am planing to build scalable application that should use laravel framework using the following blue print http://media.amazonwebservices.com/architecturecenter/AWS_ac_ra_web_01.pdf Thank you so much for your help. Have you written your Laravel 5 AWS production environment? Did you write the post for production environment? I can not find it. Hey Paul, thanks so much for this. I’d like to add my name to the list of folks looking to move a Laravel app from Homestead to EB. Even a rough blog would be helpful. Thanks so much! Do you have any plans on a production tutorial? 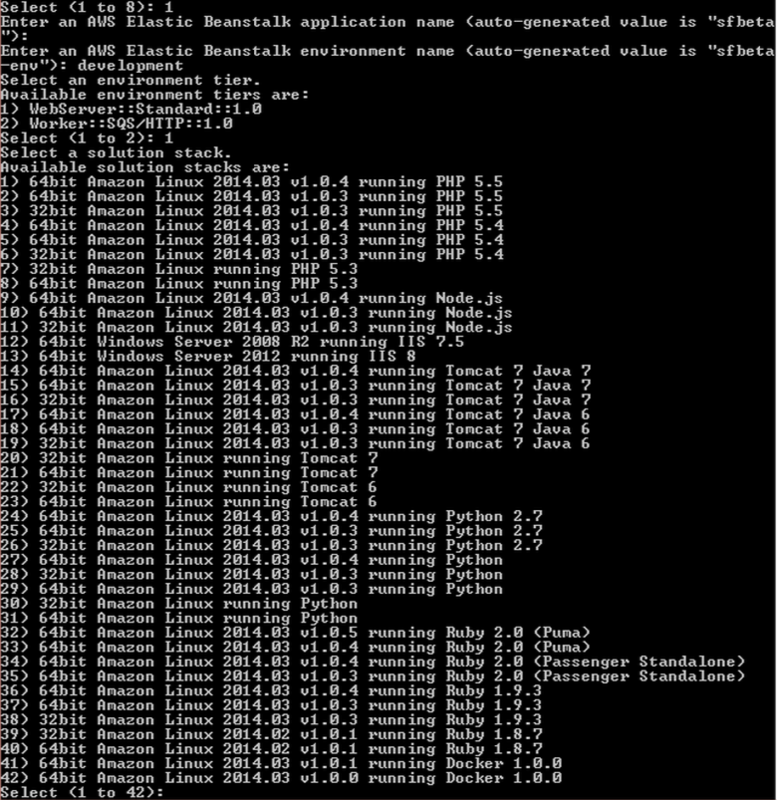 I am curious as to how to deploy my local laravel 5, running on homestead, up to amazon elastic beanstalk. There are less than a handful of tutorials and information online. I’m planning on publishing my production environment blog post for Laravel 5 within the next two weeks. I’m also looking to deploy a laravel 5 app on amazons infrastructure. Is there any update to the new post? I read over your instructions. Did you ever write the production guide for AWS? What do you think about EB and Homestead for laravel? Thank you Paul! Your post is encouraging for us. We are writing a new application stack on Laravel 5 and are going to use AWS for hosting. I’m currently in the process of ramping up EB for our deployments. Would love to compare notes, and help beta your new blog post. Can you help me understand why you choose to deploy your database outside of eb? It seems to me that our staging deployment should have it’s own database should something catastrophic happen. This would suggest having EB deploy a new RDS instance for staging and production. If you launch an RDS instance with EB, then if you take down the EB environment, the RDS instance goes down too. So if you’re looking for a zero-downtime app, your best option is to create a new environment with your new app and swap environment URLs. And from my understanding, there’s no way to move an RDS instance from the owning EB environment to a new environment. So to just simplify things, I keep the RDS instance separate. Thanks Paul. That makes perfect sense for a production database environment. For our staging environments, we will be deploying a cloned image of the database to test against. So we will probably add them to our EB environments. Of course this causes a lot of complexity when moving from staging to production. Would love to hear how others handle this. Thanks! Hey Paul. I am trying to execute a laravel web application and I am following your guide, but I am unable to do few steps, can you help me in executing the application? It would be great help. Thanks. Andres, apologies for the delay. I plan on writing the production guide for AWS within the next week or so. There have either been changes with EC2 instance permissions or with the permissions that Laravel requires in Laravel 5, but I spent many hours with AWS support getting deployment working properly. This may be causing your issues. I’ll add all of my findings in my new blog post. You can also reply here if you have a specific question. Thanks for the article. Is this still a part of you workflow btw? And have you had an issues overall related to using EB? Alfred, apologies for the delay. We are still using AWS, and I plan on writing the production guide for AWS within the next week or so. There have either been changes with EC2 instance permissions or with the permissions that Laravel requires in Laravel 5, but I spent many hours with AWS support getting deployment working properly. I’ll add all of my findings in my new blog post. Hi Paul! Thanks for sharing. I am currently evaluating AWS for a new project. Can you please update your blog with a Production Guide for AWS using Laravel? Are you currently using AWS for SimpliFit? How was your experience? Thanks in advance. Andres, apologies for the delay. We are still using AWS, and I plan on writing the production guide for AWS within the next week or so. There have either been changes with EC2 instance permissions or with the permissions that Laravel requires in Laravel 5, but I spent many hours with AWS support getting deployment working properly. I’ll add all of my findings in my new blog post.